Installing one of the optionally available extension modules in the extension slot on the rear panel lets you expand the power amp’s functional range. As an example, the following paragraphs describe the RCM-810 Remote Control Module. The RCM-810 Remote Control Module is a digital controller module for live sound reinforcement, PA and fixed installation applications. Installing the RCM-810 turns a conventional amp into a remote amplifier, which, at any time, provides complete overview of the overall system status and control of all system parameters. RCM-810 modules allow the integration of amplifiers into a remote control network up to 250 units. This offers the possibility to control and monitor an entire PA system from one or more PCs using the IRIS-Net – Intelligent Remote & Integrated Supervision – software package. All operational states, e.g. power-on status, temperature, activation of protections, load impedance, etc., are centrally registered and displayed in IRIS-Net. This provides the possibility to react and to selectively intervene even before critical operational states arise. Programming an automatic reaction, when specific thresholds are being exceeded or fallen below, is also possible. All parameters, like power on/off, muting, etc. can be controlled in real-time and stored in the amplifier. In the event of network failure or loss of power, all settings stay intact, independent of the control by the network. Furthermore, the RCM-810 provides a control port with freely programmable control inputs and control outputs. Control inputs (GPIs) allow the connection of switches. IRIS-Net offers the possibility to program a variety of logic functions for the inputs. 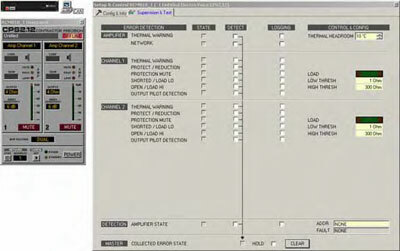 Control outputs (GPOs) allow the connection of external components, which, for example, are used to signal specific states to peripheral equipment. Consequently, an amplifier with a RCM-810 module installed corresponds to highest safety requirements. For further details about configuration, control and monitoring of amps with installed RCM-810 modules, please refer to the documentation of the IRIS-Net. The two address selector switches are for setting the network address of the RCM-810. CAN networks support addresses in the range of 01 to 250 (FA hex). Addressing has to be carried out in the hexadecimal number system. The LOW selector switch sets the lower digit, while HIGH sets the higher digit. Each address may exist only once in a system. Otherwise, network conflicts may arise. Address 0 (00 hex, delivery status) disables remote communication between the RCM-810 and the bus. The module does not appear in the system, even though it is physically connected to the CAN-bus. The STATUS LED is for monitoring the communication on the CAN-bus. The LED blinks rhythmically every 3 seconds, when the module’s address is set to "00", which means that it is disconnected from the CAN-bus and software control. The LED blinks rhythmically in intervals of one second, when an address in the range of 01 to 250 has been assigned to the module and there has not yet been any activity on the CAN-bus. As soon as communication on the CAN-bus is recognized, the LED lights for at least 100 ms, when the power amplifier sends data on the CAN-bus. The RCM-810 module provides two RJ-45 sockets for connecting to the REMOTE CAN BUS. These sockets are connected in parallel and serve as inputs as well as for daisy-chaining the devices on the remote network. 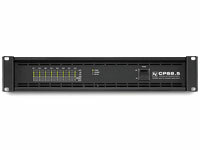 Cabling in a rack system can be established using commercially available RJ-45 network cables. However, CAN guidelines have to be observed for longer cable lengths. Both ends of the CAN-bus must be terminated using 120Ω terminating plugs. The CAN-bus allows using different data rates, whereas the data rate is inversely proportional to the bus length. For smaller network setups, data rates can be as high as 500 kbit/s. For broader networks, reducing the data rate becomes necessary (down to the minimum data rate of 10 kbit/s). The data rate of the CAN-bus is preset to 10 kbit/s. The following table illustrates the relation between data rate and bus length or network size. The use of CAN repeaters is strongly recommended for busses that exceed 1000 meters in length. The CONTROL PORT of the RCM-810 provides two control inputs, two control outputs and reference connections for +5V and ground. The control inputs are configurable via IRIS-Net™. They can be used for example for switching between power on / standby modes. The two control contacts IN1 and IN2 are internally connected via pull-up resistors and carry +5V (open). The control inputs can be activated using external switches, pushbuttons or relays to connect them to ground potential (pin 3). The two control outputs OUT1 and OUT2 are open collector outputs, which are highly resistive in the non-active state (off). In active state (on) the outputs are connected to ground. The control outputs are configurable via IRIS-Net™ and are used to signal internal states. LEDs, indicators or relays can be driven directly. The +5V reference connector provides voltage supply for connected components. The maximally allowable current at the +5V output is 200 mA.